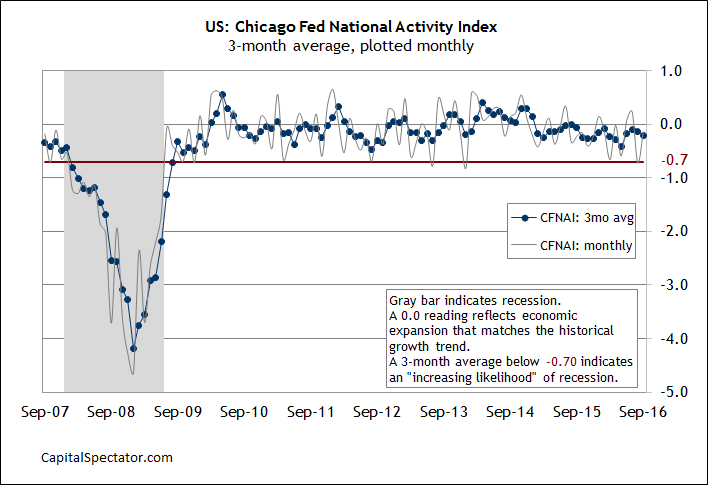 The broad US economic trend decelerated in September for a second month in a row, according to the latest update of the three-month average of the Chicago Fed National Activity Index (CFNAI-MA3). The benchmark dipped to -0.21 last month, the lowest reading since May. The below-zero data indicates that economic activity remains moderately below the historical trend rate, although the rebound in the macro trend since the spring has stumbled in the last two months of the third quarter. On a positive note, the current three-month average is still well above the tipping point of -0.70 that marks the start of recessions. In addition, the monthly data for the index rebounded in September after slumping to the lowest reading in more than two years in August. Nonetheless, all four of the broad categories that comprise the Chicago Fed National Activity Index posted negative contributions last month for the second time in a row. The good news: the declines were relatively shallow compared with the across-the-board tumble in August. The main takeaway in today’s report: CFNAI-MA3 shows that US economic growth rate has weakened, raising questions about this Friday’s “advance” GDP report for the third quarter. Economists, however, are still looking for an encouraging revival in growth. Econoday.com’s consensus forecast sees Q3 GDP rebounding to 2.5% from 1.4% in Q2. If the projection is accurate, quarterly growth will pickup to its strongest pace in more than a year. But today’s CFNAI-MA3 update hints at the possibility that the improvement in Friday’s report may be softer than the crowd’s expecting.